It’s the kind of thing that, though outrageous, you might expect from a fairly large city with a leftist government. [Department of Miseducation bureaucrats’] latest education-destroying innovation is eliminating the disproportionate suspension and expulsions of African-American students. This is not empty rhetoric; it is included in the Obama administration's $4.3-billion Race to the Top initiative, and schools that fail to mend their ways will lose federal funds and face expensive litigation at a time of shrinking education budgets. In fact, the future is already here, as schools are increasingly being targeted in resource-draining civil rights complaints about disciplinary unevenness (see here). …How is this seemingly alluring "racial fairness" to be accomplished? The answer is not on a case-by-case basis by scrutinizing millions of outcomes to detect bias. Instead, bureaucrats will use the "disparate impact" approach — i.e., it will be assumed that racially disproportional punishment inherently equals racial discrimination. Thus, if African-Americans constitute 30% of the student body but half of all expulsions, racial discrimination is demonstrated. … [And] [a]ctually, racial disparities are just the beginning. Obama's Secretary of Education, Arne Duncan, has also called for proportionality for disabled students (see here), and while "disabled" might conjure up images of wheelchair-bound students, this category also includes those with below-average intelligence, often compounded with psychological problems inclining them to disruption, if not violence (see Tomsho and Golden, "Educating Eric: A Troubled Student Was Put Into Regular Classes. Then He Killed the Principal." Wall Street Journal, 2007, May 12-13). Professor Weissberg then delves into many of the problems this scheme presents, such as the removal of teachers’ discretion and the cataloguing of racial identities (think: a half-white man who becomes an all-black candidate for political benefit). He asks if schools will have to hire a “Racial Identity Officer.” Weissberg also points out that the quota system victimizes the very group it is ostensibly meant to liberate, as undermining discipline in racially mixed schools hurts the education of all — including blacks. Obama’s scheme is also a disaster for race relations. After all, what kind of emotions will be evoked in white and Asian students when they receive punishment while blacks get a special dispensation?Like the Black Panther fiasco, Joseph Lowery’s anti-white statements at Obama’s inauguration, and The One’s handling of the Henry Louis Gates affair, it’s yet another example of our “post-racial” President’s �ber-racial passions. Why would left wing-crafted federal policy assume that racial minorities being expelled from public schools at a disproportionate rate in and of itself is "discriminatory" or "racist"? Because the administrators are incompetent? But then that would mean they need to receive better training, or be fired, which the Obama administration doesn't propose. Instead, the Obama administration tacitly posits that because it is mostly White administrators performing the expulsions, there should be a presumption of racist motives based on the (White) color of their skin. That means left-wing policy itself is anti-White racist. But again, the Obama administration doesn't subsequently call for racial sensitivity training for these "racist" administrators, nor call for their firing. Instead, it essentially issues a blanket declarative federal policy that all students must be retained at the exact same rate regardless of their ability to perform or behave, all apparently because it believes administrators are secret racists and bigots, hell bent on picking on certain categories of students. 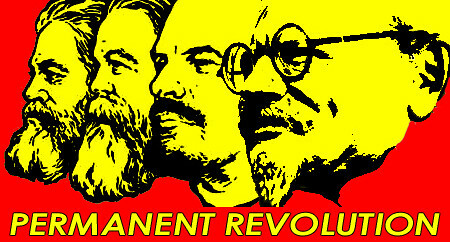 But of course, it doesn't truly believe any of this; what it actually is pursuing here is a larger left-wing agenda based on the theory of "permanent revolution" in which settled and structured "bourgeois" society (which in the Bolshevik-origins of Communism/leftism was code for "Christian") is considered stifling, static, oppressive and bigoted, and thus must be constantly harassed, harangued, destroyed and burned down for history to progress. And part of that process of destruction is destroying the public schools and utilizing the young as agents of chaos and revolution by keeping them maladjusted, ignorant, primitive, frustrated, and rebellious. Leftists and other infantile narcissists so readily intellectually embrace this theory of "permanent revolution" because they themselves suffer from arrested development, and the theory dovetails nicely with their own innate proclivity towards infantile tantrum-throwing and violence born of selfishness, mental immaturity, and narcissism. In short, they are mentally stunted, hence immature intellectual theories and their manifestations carry for them tremendous appeal. There can be no intellectual reasoning with such an ideology or those who embrace it, because there is no good will in their intentions. The only response to such a people is extreme social marginalization and isolation until they mature and see the light, or don't, in which case they will go to the grave mentally and spiritually undeveloped, but at least having been restrained from perpetrating massive and possibly fatal destruction upon society as a whole, and possibly the entirety of Western Civilization itself.